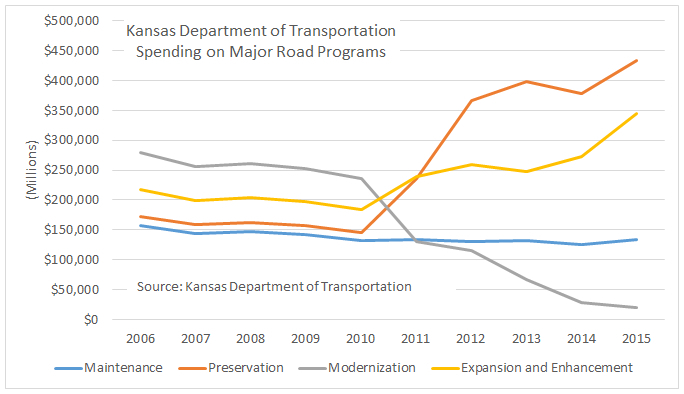 An op-ed by an advocate for more highway spending in Kansas needs context and correction. When we look at actual spending on roads, we see something different from what is portrayed in this op-ed. KDOT’s Comprehensive Annual Financial Report shows spending in the categories “Preservation” and “Expansion and Enhancement” has grown rapidly over the past five years. Spending in the category “Maintenance” has been level, while spending on “Modernization” has declined. For these four categories — which represent the major share of KDOT spending on roads — spending in fiscal 2015 totaled $932.666 million, up from a low of $698.770 million in fiscal 2010. In light of this rising spending on roads, we have to wonder what is the point of Mr. Totten’s op-ed. That is self-evident. The purpose of the Kansas Contractors Association is to have the state spend as much as possible on projects that benefit its clients, which include contractors, construction companies, and material suppliers. It matters not whether the spending is needed, wise, or the proverbial “bridge to nowhere” — the goal of Mr. Totten is more spending by Kansas taxpayers to benefit his association’s members. 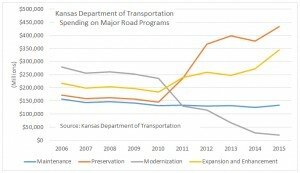 KDOT spending. Click for larger version. Kansas highways and Interstates are in wonderful condition. Where you find bad roads is when you pass the “city limits” sign. A lot of cities and towns have let the conditions of their streets get real bad.